We all have much to be thankful for and Thanksgiving is the one day a year when we all give that subject some thought. We may do so throughout the year, but at least on this day we give the subject some serious consideration. 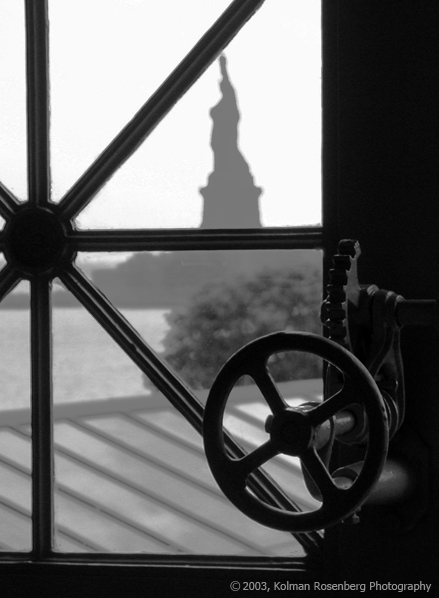 I captured this photo in 2003 and as soon as I saw this scene, from the Great Hall at Ellis Island, I immediately thought of my ancestors and the ancestors of so many others who may have stood on the same spot and gazed out at the same scene through the misty harbor and were so grateful to have arrived in this great country. Even today, 8 years later, this photo puts a lump in my throat and a tear in my eye every time I look at it. Whether our ancestors came through Ellis Island or not, this country has given us all much to be thankful for! This entry was posted in Uncategorized and tagged Ellis Island, Gateful, Great Hall, Harbor, New York, Statue of Liberty, Thanksgiving. Bookmark the permalink.